Profile-wrapped parts expand component firm’s profits. Great Lake Woods produces hardwood components for the kitchen cabinet business, as well as furniture parts for residential and office applications from its plant in Holland, MI. 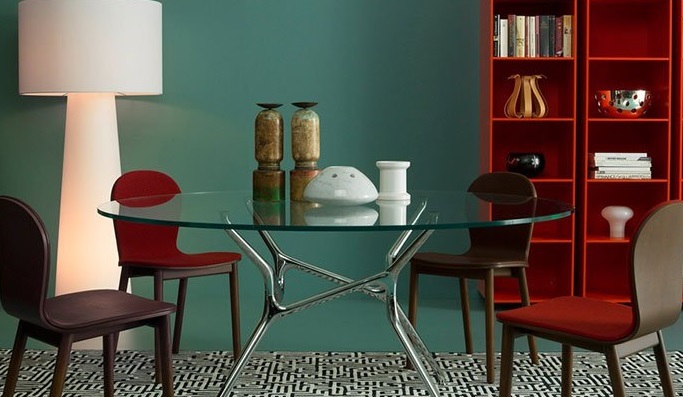 Among its clients are office furniture manufacturing giants Steelcase, Herman Miller and Haworth. Great Lake Woods has grown at a double-digit pace in the highly- competitive wood component market by meeting customer expectations with consistent on-time delivery. In a little more than 12 years the Holland, MI-based company has grown to a total of 80 employees. The company has developed a marketing niche providing quality wooden and wrapped mouldings to the architectural, kitchen and bath, furniture, residential and store fixture industries. The company currently has 60,000 square feet of manufacturing space, of which 22,000 was added in 1999. Next year, the company anticipates adding an additional 22,000 square feet to its plant to accommodate anticipated increases in production. A fully equipped, full-service woodworking shop has provided the impetus for the company to grow. On-site ripsaws, six Weinig moulders, a tenoner and a pair of Omga double-sided V-2013 NC miter saws are among the high-volume equipment that enables the company to process 500,000 to 600,000 feet of mouldings weekly. While the company has not had any problems cranking out large numbers of parts, it did fall short at times to take on sophisticated custom projects. This was apparent in early 1998 when Keith Malmstadt, one of Great Lake Woods’ owners, says the company had a specific manufacturing application that proved to be extremely complex. At the same time, Malmstadt required a split vacuum table to function independently of each other in order to allow for continuous production on the machine. Finally, he required that the machine be heavy enough to handle hardwood products because of the wide variety of solid wood components the company manufactures for its customers. “We cut virtually all kinds of wood,” says Malmstadt. “In any give day, we’re working with all kinds of American hardwoods, including ash, beech, hard and soft maple, poplar, red and white oak, walnut and MDF. We also work with a variety of exotic woods, such as mahogany.” He adds that customer workpieces range in size from as small as 1/2 inch by 2-1/2 inches by 2-1/2 inches to as large as 2 inches by 24 inches by 96 inches. After narrowing his list to six manufacturers, Malmstadt chose an ANDI Stratos WFD router from Anderson America Corp. It features a single overhead spindle, automatic tool changer, drill pack, saw arbor and a 5-foot by 9-foot split vacuum table. Delivery and installation of the Stratos was completed in early 1999. New shop personnel with CNC skills were brought on board to operate the machine. Anderson America and the local dealer provided training through the start-up phase. The vacuum table has proven to be a good choice for the company, he adds. For many applications, the table provides enough power to hold large sheets of material in place during routing operations. For other operations, the company designs and builds special fixtures to hold workpieces in place. Although purchased specifically for a limited product line, the flexibility of the machine has allowed Great Lake Woods to develop other applications. “The router allows us to produce new parts that we couldn’t do before,” Malmstadt says. 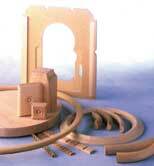 This includes complex decorative hardwood trim pieces, MDF shaping, boring and saw arbor applications. Currently, the router is running continuously in one shift. Plans are in the works to move to a two-shift operation, as the company has secured new business for specific customer parts that require router operations. Malmstadt says that they are in the process of converting customer designs to the actual part programs on the CAD systems. “Utilization of CNC machining technology has enhanced Great Lake Woods’ ability to be competitive,” says Malmstadt. He adds that the overall capability of the company has been increased, which results in meeting customers price points and maintaining on-time delivery schedules. The company, which was founded in 1988 and is co-owned by Keith Malmstadt and Ben Philips, has carved out one of its most lucrative product niches from using the scrap wood pieces somebody else does not want. By profile wrapping fingerjointed materials for interior and cabinet mouldings, as well as cabinet door and door frames, Great Lake Woods has been able to cost-effectively offer components to local furniture customers, and now hopes to expand its scope out to a larger, more expansive clientele. Fingerjointed mouldings, typically consisting of poplar and occasionally basswood or aspen, represent one of Great Lake Woods’ fastest-growing product lines. The fingerjointed pieces, purchased from Red River Hardwoods of Kentucky, are profiled on one of the company’s six Weinig moulders, then wrapped with a variety of veneers, including cherry and mahogany, on a Barberan PL45 profile wrapping machine. The ANDI Stratos CNC router’s ability to shape, bore and saw allows Great Lake Woods to machine more complex wood and MDF parts for its customers. According to wrapping supervisor Wade Brooks, many of Great Lake Woods’ customers are driven toward fingerjointing because they need a product that is both consistent and straight. Fingerjointed products offer the end-user both benefits in one package. Great Lake Woods produces a wide range of products, including trim mouldings for cabinets, top caps for Haworth’s office furnishings, signboard mouldings and casket parts. Great Lake also produces fingerjointed frames for various applications, including hollow-core doors and closet applications. Production supervisor Rich Popa notes that the company has taken on special jobs because it has the knowledge and expertise to work with fingerjointed materials. For example, he says, Great Lake worked in conjunction with Herman Miller and the federal government to produce more than 6,000 fingerjointed tackboard panels in the first six months of last year. Great Lake Woods had a fingerjointing machine in 1990, but the company discontinued producing fingerjointed material in 1992. When Malmstadt came on board in 1994, he says he recognized the potential market for it and discussed it with others at the company. Great Lake Woods has not looked back since deciding to purchase fingerjointed materials from Red River Hardwoods. In fact, because Malmstadt predicts demand for fingerjointed products will continue to grow, Great Lake Woods is studying the possibility of purchasing a fingerjointing machine to manufacture product from its own roughmill. For the time being, though, Great Lake Woods is content to bring the fingerjointed blanks in, mould and wrap the product, and then send it on its way. “The biggest savings for profile-wrapped materials is in the quality, the yield and the lack of rework, Malmstadt says. “Companies can get a fingerjointed 15-foot-long piece and it will have the quality of an 8-footer that is solid wood.